Jenna Freedman reads from one of her zines at Lili Coffee Shop. July 1, 2011, Pittsburgh. Photo by Artnoose. Zine librarian Jenna Freedman came to Pittsburgh this July on The Orderly Disorder: Zinester Librarians in Circulation Tour with a small troupe of librarians who were on the road in between the ALA conference in New Orleans and the Zine Librarians (Un)Conference in Milwaukee. Jenna is a zine librarian at Barnard College, and a very active member of the Radical Reference Librarians; she has helped catalog the Occupy Wall Street Library. I got to see Jenna speak in my first semester of library school, and she was a large part of my inspiration to focus my studies on small press cataloging and collections. Jenna blogs at the Lower East Side Librarian, and she often reviews zines and small press books. This year she is recommending three zines and three books and she's included links to her reviews of each title. 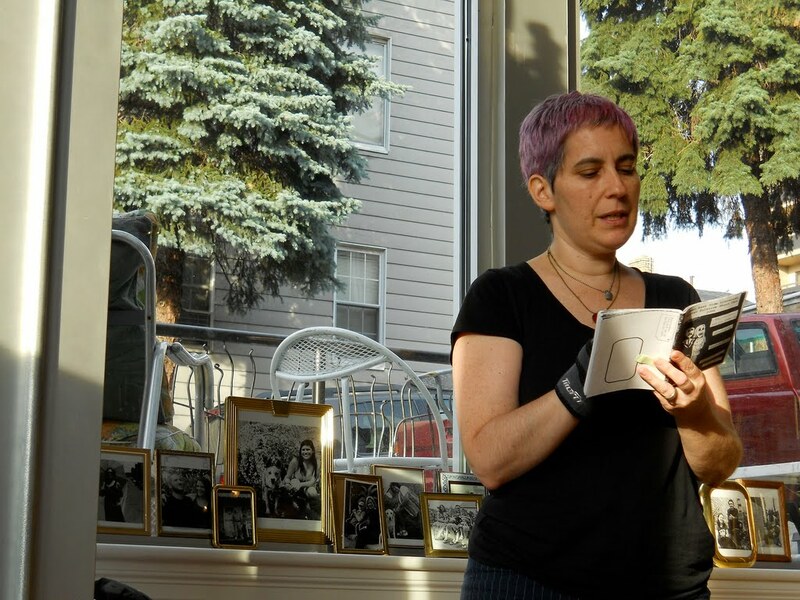 Pittsburgh's own master of zines, Artnoose, organized the Pittsburgh reading for Jenna & friends, which was held in Polish Hill at Lili Coffee Shop. (See Day 3 for my ode to Lili). Artnoose (who was based in the Bay Area for many years) writes, typesets, and prints the zine Ker-Bloom! ; I'm a big fan of her storytelling, and her letterpressed zines have a great visual aesthetic, too. 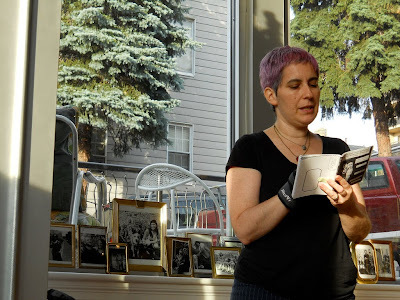 She relocated to Pittsburgh a few years ago and is now a resident at the Cyberpunk Apocalypse Writers House, a space dedicated to supporting writing-in-progress, with an emphasis on zine writers.